Payment Mode - MP Online Kiosk. Education Qualification : English Steno- Passed Graduation from any recognized University and Shorthand 80 wpm. Law Clerk/Translator- Passed LLB Degree. 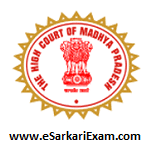 Eligible Candidates can Submit Application at the Official Website of MP High Court latest by 9th September 2018. Applicants First Logon to MPHC Official Website. Click on Recruitment/Result Link at Home Page. Open and Read Mains Advertisement and Check Details. Now Click on Mains Online Application for English Steno Recruitment Link. Take Application Printout and Send it Along with Self Attested Copy of Relevant Documents. Keep it in A Sealed Envelope Superscribed With "Application for Main Examination for The Post............of English Stenographers in High Court of MP Exam 2018". Send it To the Address : Registrar(Exam), High Court of MP (Jabalpur) MP. Application should Reached Latest by 25th Sept 2018.